A wild mountainous pass, led along a series of sheep tracts, into Nant Lie. Trees, chiefly old oaks, had withstood the fury of perhaps a hundred winters; the limbs shattered, covered with moss, and bared of leaves... several small farmers' cottages among the trees... an ancient over-shot mill, between the pools. The mountain grandeur of the vale was broken by the wooded foreground; and the water of one of the lakes, from the rays of the sun, which shot obliquely upon it, glittered through the dark foliage of the trees. Western Arfon - the town of Caernarfon and its hinterland, the valley of the Gwyrfai, the villages of llanwnda and Groeslon, the slopes of Moel Tryfan, the Nantlle valley - includes some of the most spectacular scenery in Wales. It is rich in history and archaeology, from the Bronze Age through the great Edwardian castle at the mouth of the Seiont, to the industries of the nineteenth and twentieth centuries. It is home to a unique and vigorous minority culture and language. We tend to see our landscape, our history and our culture as separate things. In reality, they are closely intertwined. The farmers who since Prehistoric times have struggled to earn a living from the inhospitable slopes have bequeathed the ruins of their homes and the straggling field walls of the uplands. The quarrymen who worked the slate-veins of Nantlle and Moel Tryfan not only created the deep pits and the towering mounds of slate rubble, but also sustained the inspiration of poets, preachers and writers of fiction. 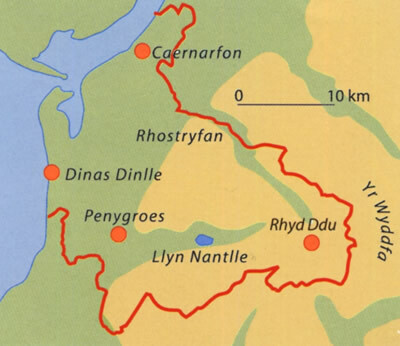 The present-day strength and confidence of the Welsh language within the area reflects not only the landscape's remoteness in times past but also its ability to sustain the growing, increasingly literate, population of the nineteenth century. Myth and legend, too, affect the landscape. 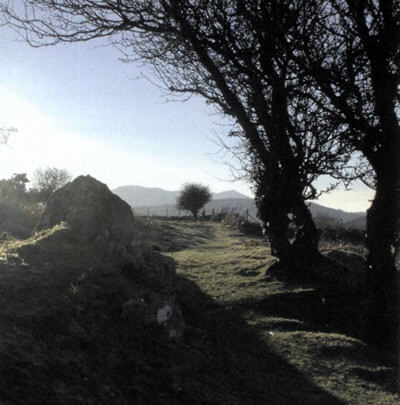 The traditional and mythological tales brought together in the Mabinogi find a visual setting in the local landscape. Two thousand years of farming are visible in this photograph of fields near Rhostryfan. In and amongst eighteenth and nineteenth century enclosures, traces of Iron Age or Romano-British round houses survive in the uncultivated area. 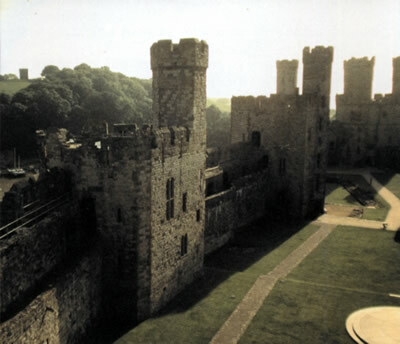 The persistent memory of Macsen Wledig conditioned Edward I's thinking in the creation of a new castle in echo of the patterned angular walls of Constantinople, ancient capital of the late Roman empire. It is because all our landscapes are cultural landscapes - affected in one way or another by past and present human society, and in turn affecting the way our communities and cultures evolve - that our hopes of preserving the best of our inheritance depend on understanding our historic environment. The European Union has now asked twelve archaeological organisations in twelve different countries to interpret a landscape area - through websites, booklets and leaflets; meetings and seminars. How will interpretation of the landscape benefit people of the area? By fostering a sense of pride in the local landscape and environment. By encouraging a sense of ownership of the landscape among school-students and young people. By emphasising the richness and diversity in the landscape. Interpretation of the landscape will assist the work ensuring creative and sustainable decision-making in local government and planning. 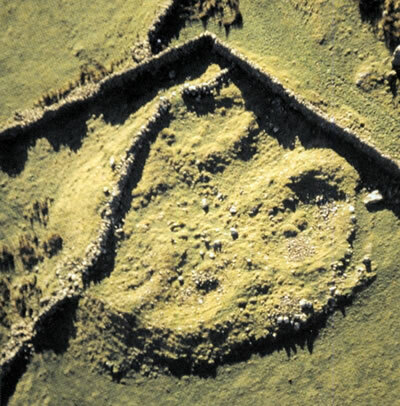 The work will be carried out by the Gwynedd Archaeological Trust. The aim of the Trust is to promote a broader understanding of the historic and archaeological richness of North West Wales.